I’ve been looking forward to today’s post for quite some time. Not too long ago, I blogged about trying to instill values we hold dear, in our children. It’s a constant conversation in this house and we do not claim to have any answers. Many times we feel like we get it right and so many other times we feel like we are failing. Whether it’s teaching them hard work and honesty, or gratitude and service, it’s a constant attempt and we just hope and pray some of it sticks. A certain song really resonated with all of us and it now hangs on our wall. Can’t wait to show you. Every year we travel to Big Bear with two other families. There are eight children altogether and they have known each other since they were babies. I have been friends with the adults in the group since before marriage. Needless to say we go way back and they are truly some of the best people I know. I feel so lucky that my children have such great influences in their lives. 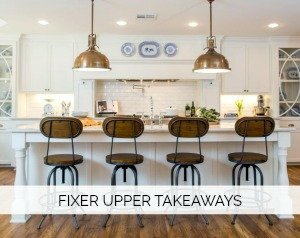 This past summer, the kids had all gone to bed and the six adults were sipping wine and listening to music out on the back patio under the stars. We talk for hours on these trips about raising children, how we were raised, and heed advice from one another. It was on that trip that one of our friend’s played the song, “Humble and Kind,” for us. I had not heard it before. Every single word resonated with me. Have you heard it? It was originally written as a prayer from a mother to her children. 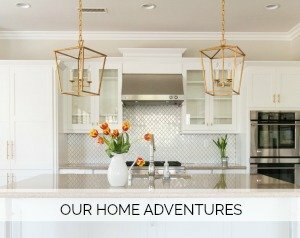 It’s simple and gorgeous and everything we want for our kiddos. Tim McGraw went on to record it and I love everything about it. I knew I wanted this special prayer hanging in our home. When Tara and Andy said they would create this sign for us I pretty much lost it. Just so so special for us to have in our home. 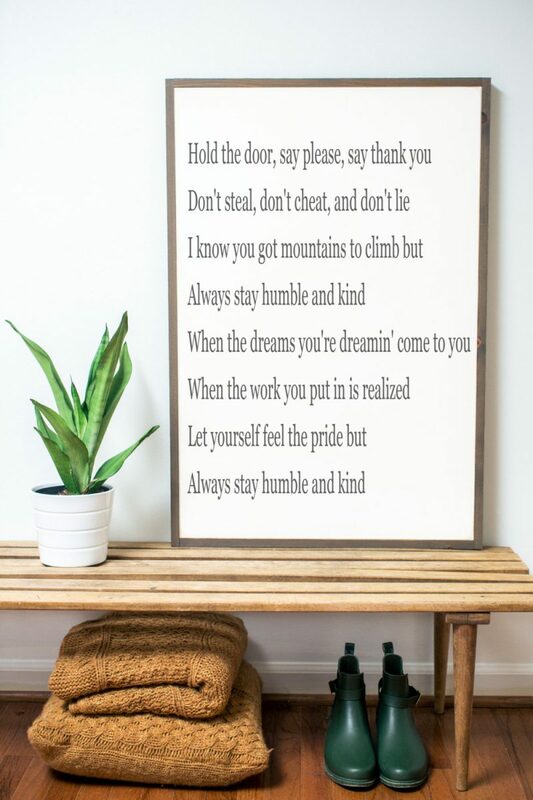 The Humble and Kind sign is now in their shop in case the lyrics speak to you and your family, too. We’ve hung it in a spot where all four of us see it every single time we head upstairs. Some of you may remember the hidden messages we wrote on our stairs. It’s also visible from our dining room and has already sparked so many interesting and worthwhile conversations while entertaining. We can’t thank Tara and Andy enough. The words are just so simple and true. We want nothing more than for our children to reach for the stars and accomplish all of their dreams. “When the work you put in is realized let yourself feel the pride, but always stay humble and kind.” If you have never heard this song by Tim McGraw it’s really worth listening to. I always think of our friends sitting under the stars overlooking Big Bear lake listening to this song for the first time. You can see we have a ton of blank wall space going up our stairs, but this was the most important piece of art for us to hang. A bit of a family anthem and love seeing it every single day. If you have a moment, head over to Between You and Me Signs. I promise you’ll be impressed. You’ll also see the “O Holy Night” sign which we hung in our living room during the Christmas season. Thank you again, Tara and Andy. We are all in this parenting thing together and I love being able to share these beautiful lyrics with anyone who walks into our home. Have a good day, my friends. Love that song and the meaning of those words. We are trying to instill those values in our kids too and it’s a constant conversation here as well. The sign is perfect! I might have to have this in our home. Thank you, Becky. Isn’t parenting a constant challenge. Nothing better and nothing harder. I hope the sign makes its way to your home. We truly love it. Hope you’re off to a great week. P.S. At 33 weeks pregnant, the tears are pouring down my cheeks as I listen to it! Oh, you’re so sweet. Well you’re not alone. I cry each time I watch that and listen to all of the words. I hope your family loves it when they hear it, too. And congratulations. You’re getting so close to meeting your new baby! So exciting. Such a blessing. They are an amazing couple, and do beautiful work. Love the song, and that you chose it for this purpose. 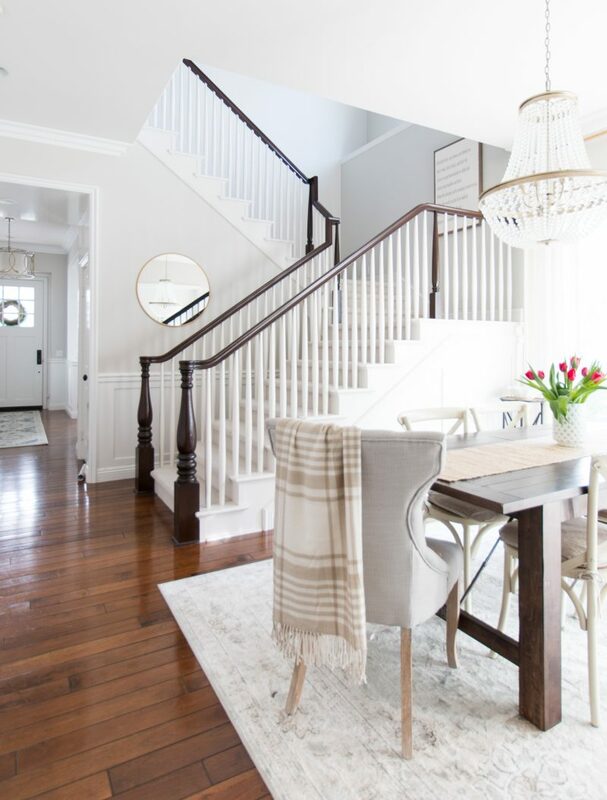 Sometimes I think just one gorgeous piece is all it takes to make a space shine! I think I may agree with you. Sort of love the simplicity of just having the song on the wall. And couldn’t agree more. So thankful to Andy and Tara. Such a blessing for us. I had heard this song many times but it wasn’t until I heard the songwriter interviewed on NPR that it really hit me how wonderful the words are. I’m so glad you have them on your wall, so special for your family! Oh, I love that. The words really do just stay with me when I hear it. Now I just need Ryan to learn how to play it on the guitar and we will be set. Loving watching all of your progress as you all get settled into your new beautiful home. So special. My son, David Thomas, and his co-workers, have just published a wonderful book that the song fits perfectly. It is entitled, “Are My Kids on Track”. … the emotional, social and spiritual milestones your child needs to reach. What a wonderful song.! What a wonderful book! Duh, just saw that you linked the video! LOVE that song and your sign!! I also love the color of your walls! If you don’t mind sharing, what brand and color is that?? That is my favorite song of all time! I’ve listed to it a million times and still get goose bumps. Now I’m off to check out the amazing print. This is our schools motto this year and so I’ve been hearing it a lot. Love love it and love this beautiful sign!! I was so touched when I heard this song , thank you for bringing it back in my life! You picked a great spot , might have to go search for one in our home ! I love this song, I had never heard of it before. The words are very very true. Unfortunately Between You and Me Signs doesn’t ship to the Netherlands. Aww! You’re my kinda people! I love that song and I play it often for my kids. In fact, if they fight or are unkind to each other, my punishment is that I will play it over and over and over again and sing at the top of my lungs until they apologize and right their behavior. LOL They giggle, but the message totally gets through to them. Love love love!! I’m going to buy one for my wall too! Love you friend! oh i love this and that you have it in such a space that will serve as a constant reminder for your family. Our kids ( and us parents) can never be reminded enough of how to walk through life with humility and putting others first. i have a few of Tara and Andy’s signs and love them all. I just love everything about this post…the words….the song…it all just warms my heart. Thank you for sharing! This song is a family favorite. I love that my kids have it on their playlists. The perfect words to have on the wall of your home! The sign is beautiful. Enjoy it. I love that song! I never thought to hang the lyrics in my home though, great idea! 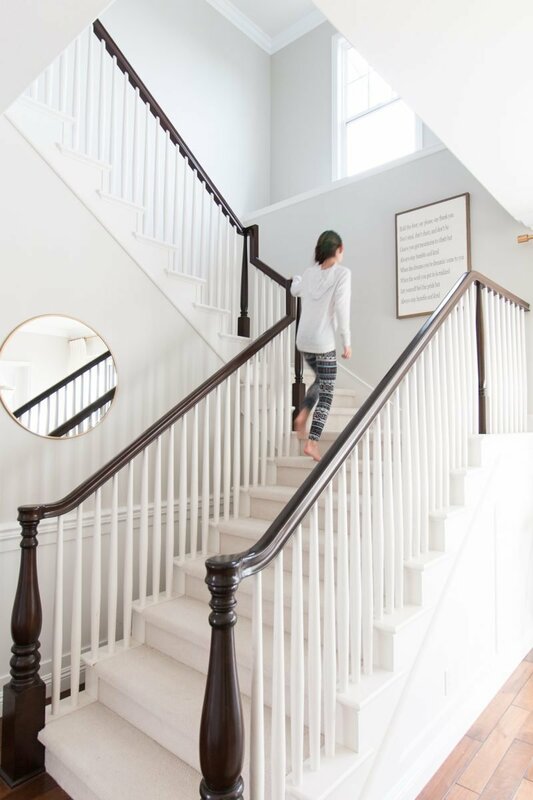 And your staircase is beautiful, too!